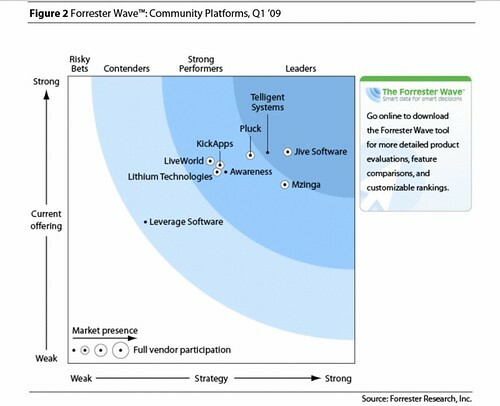 Clients can access the full report The Forrester Wave™: Community Platforms, Q1 2009 on the Forrester site, however the high level findings are available below, as with all of our reports, we stand by our products. Used correctly, communities can impact the top and bottom line of company’s financials: from brands encouraging customers to self-support each other (reducing costs), to spreading word of mouth to each other (efficient marketing and increased sales) to crowd sourcing innovation (streamlining R&D) communities matter more than ever –especially during a recession. Many of our clients follow the POST methdology, which is a framework for them to first understand the People they’re trying to reach, and how they use social technologies. Then to pick an Objective that aligns with their business, next, they will spend most of their time scoping out the Strategy, which includes internal processes, stakeholders, roles, budgets, empowerment, policy, and change management. Once you’ve done that, only then you’re ready to choose a vendor, which is the Technology. As a rule of thumb, successful brands focus about 80% of their efforts on the People, Objectives, and Strategy, and about 20% effort on Technologies –don’t get it backwards. Many an entrepreneur has realized this community opportunity, when I started to cover this market there were 8 vendors on my list, today the space now boasts 100 vendors and it continues to grow. Fortunately, the Forrester Wave reports are designed to segment crowded industries. It’s important that your realize this report is for interactive marketers at enterprise-class companies that are seeking to deploy customer communities –not for the internal intranet, collaboration, or insight community vendors. Having spent my time as a community manager at Hitachi and coupled with research we know that successful community deployments are far more than forums, blogs, rss or other technologies. As a result, we applied over 60% of our weighted criteria based on what our clients tell us they want, a solutions partner that delivers strategy, education, services, community management, analytics and support. During a recession, brands want to be sure that vendors are around for the long term, so we also factored in leadership, executive team, client base, and of course, financial viability. What did we find? First of all, this is still a very young market, with the average tenure of a company being just a few years in community. Despite the immaturity, we evaluated nine and were impressed with Jive Software and Telligent Systems who lead the pack because of their strong administrative and platform features and solution offerings. Next, a group of vendors ranked as strong performers: KickApps and Pluck enable large Web sites to quickly scale with social features. Also in the strong performer category, Awareness, Lithium Technologies, and Mzinga enable brands to build branded communities while LiveWorld offers brands agency-like services. While Leverage Software is not on par with the others in the category, they are ideal for medium-sized businesses and due to their cost-effective platform could have a strong position during this economic downturn. We don’t live in a world of absolutes, and we understand that the needs of one brand will differ from another, so clients that can access the report can also download the excel sheet. This detailed excel sheet for clients (which has scores, explanations, criteria, scoring criteria) has ‘sliders’ and ‘toggles’ that make it easy for brands to dial up or down specific criteria –creating a custom Wave report for their needs. Different business needs require different vendor offerings, so the Wave is flexible, you can make it your own. First, we vetted the 100 vendors to submit to a vendor product catalog, over 50 submitted which we used the data to pair down who were appropriate for the Wave report. Hands-on lab evaluations: I spent up to 6 hours with each vendor in a windowless room to evaluate their product live using common customer scenarios. I grilled the executive team, and discussed their strengths and weaknesses. Product demos. We asked vendors to conduct demonstrations of their products’ functionality. We used findings from these product demos to validate details of each vendor’s product capabilities. Customer reference calls. To validate product and vendor qualifications, Forrester also conducted reference calls with up to three of each vendor’s current customers for a total of up to 27 customer calls. We collected hundreds of screenshots, presentations, samples, reports and all of this information was entered in a multi-tab spreadsheet that accounts for thousands of cells, scoring, and detailed explanations which clients can use to toggle up and down specific needs as in some cases, specific feature needs may need to be highlighted over others. In the bottom links, I’ve made my research process very transparent, and have indicate the other three other blog posts documenting this laborious research effort. Although this report is a snapshot in time, and some vendors have expressed they’ve made some improvements to date, to keep this long process from going further, we have to put a cap on the updates. Therefore, I will continue to keep the market updated with the the social networking weekly digest just as I have for the past years. In the spirit of the community conversation, if you’re a vendor in this wave in this space, I encourage you to voice your opinion online, I’ll make sure the market sees it, I strive to be fair. This was the most difficult project I’ve had to do in a long time, and I’d like to thank Shar VanBoskirk (editor), Christine Spivey Overby (editor and my manager), Angie Polanco (Research Associate), Oliver Young (subject matter expert), Sarah Glass (who went beyond the call of duty as a Senior Research Associate), Zach Reiss-Davis (Research Associate), Megan Chromik (editing), and Josh Bernoff (moral support), I couldn’t have done it without you guys, I assure you, it was painful for them as well as me. Yet the pain will pay off for our clients as brands can easily find vendors that will meet their specific needs. I’ve been passionate about the community market far before I became an industry analyst covering this space, and am glad to serve the industry. We went to great lengths to be objective, accurate, consistent, detailed, and fair and hope this accelerates your business. Thanks for your patience, and enjoy the Wave! I’ll be updating this section as I see interesting voices from media, vendors, brands and customers. Telligent’s corporate blog chimes in and makes the report available for you. Forrester’s Interactive Marketing Blog: I’ve cross posted this same content on our blog for interactive marketers. Max Kalehoff discusses the wave and talks why he choose Telligent –and how they can improve. Barry Hurd: Corporate Social Media Platforms – great info to check out.